s-SNOM is used for a wide range of applications including graphene and novel 2D materials with spatial resolution down to 10 nm. 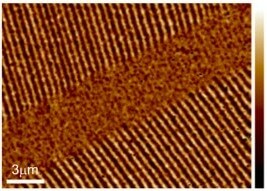 Nano imaging of surface phonon polaritons (SPhP) on hexagonal boron nitride (hBN). (a) AFM height image shows homogeneous hBN surface with different layers on Si substrate; (b) s-SNOM amplitude shows strong interference fringes due to propagating SPhP along the surface on hBN; (c) s-SNOM phase shows a difference phase with layer thickness. From the image b and c, we can also see the wavelength of the SPhP changes with the number of layers. s-SNOM phase and amplitude images of surface plasmon polariton (SPP) on a graphene wedge. (left) 3D view of Phase image. (center) s-SNOM phase with a line cross-section of the SPP standing wave; (right) s-SNOM amplitude. s-SNOM measurements of purple membrane reveal distribution of protein within the lipid membrane. AFM height (left); s-SNOM phase image with IR source tuned to the amide I absorption band (center); s-SNOM phase image off-resonance (right). 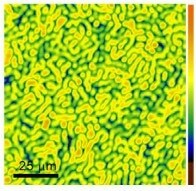 For the first time, complementary AFM-IR and Scattering SNOM images demonstrate the microscale origins of optical chirality on plasmonics structures. Unique and complementary plasmonic properties can be achieved by accessing the radiative (s-SNOM) and non-radiative (AFM-IR) information on plasmonics structures. Khanikaev et al., Nat. Comm. 7, 12045 (‘16). Doi:10.1038/ncomms12045. 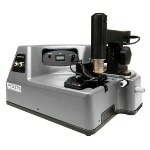 s-SNOM can be employed to measure multi-layer polymeric films. In the below figure, absorption bands at 1640 and 1540 cm-1 were seen for nylon. Subsequent s-SNOM imaging at 1640 cm-1 demonstrated contrast between the nylon layer and PE layer. Sample provided courtesy of DSM. 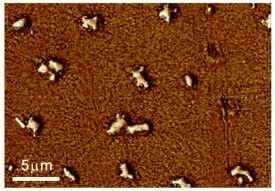 The AFM provides correlated property mapping with nano-mechanics, nano-electrical, nano-chemical, nano-thermal and topography. 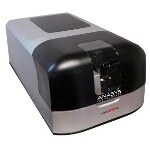 Each product in the Anasys Instruments family is developed around the company’s full featured AFM supporting numerous routinely used AFM imaging modes, such as CAFM, MFM, EFM, force modulation, lateral force, force curves, contact, phase, tapping and more. Tapping image of block copolymer. Force modulation of polymer blend. Magnetic force microscopy of a magnetic tape. Tapping phase image of polymer nanocomposite. Broadband nanomechanical spectra utilizing Lorentz Contact Resonance (LCR) provides valuable information about differences in material stiffness, friction and viscosity. LCR provides sensitive material contrast on materials that range from soft polymers to hard inorganics and semiconductors. Nanomechanical spectra (left) discriminate materials on the basis of stiffness and damping. Examples of LCR stiffness maps on complex polymer blends (center) and high performance paper products (right). This award-winning technology, developed by Anasys Instruments, employs Anasys ThermaLever™ probes to locally increase the temperature of the sample in order to map and measure thermal transitions and other thermal properties. 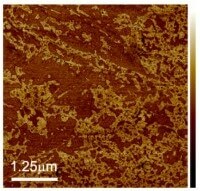 Left: nanoTA uses a heated AFM tip to measure glass transition and melt temperatures with nanoscale spatial resolution. Middle: Thermal transition curves on a 21 layer laminated polymer film. Right: Scanning thermal microscopy visualizes variations in temperature and thermal conductivity on a sectioned circuit board.